진리의 세계를 두루 통솔한다는 의미를 지닌 비로자나불을 형상화한 작품으로 전라남도 광주군 서방면 동계리에 있던 것을 1934년 증심사로 옮겨 온 것이다. 현재 광배(光背)와 대좌(臺座)는 잃어버렸지만 불상 자체는 완전한 편이다. 머리에는 작은 소라 모양의 머리칼을 기교있게 붙여 놓았으며, 정수리에 있는 상투 모양의 머리(육계)가 유난히 높고 뚜렷하다. 눈·코·입 등이 알맞게 조화를 이루고 있는 얼굴에는 부드러운 미소가 번져 있어서 온화하고 현실적인 인간의 모습을 느끼게 해준다. 전체적으로 신체는 두꺼운 옷에 싸여 있어서 굴곡이 드러나지 않고 있지만 무릎 너비와 적절한 비례를 이루고 있어서 안정적인 느낌을 준다. 양 어깨를 감싸고 있는 옷은 가슴을 넓게 드러내고 있으며 양 팔에 걸쳐진 두꺼운 옷자락은 규칙적인 평행의 옷주름을 이루면서 흘러내리고 있다. 손모양은 왼손이 오른손 검지를 감싸 쥔 형태로 일반적인 비로자나불이 취하는 형식과는 반대로 되어 있는 것이 특이하다. 이 광주 증심사 철조비로자나불좌상(光州 證心寺 鐵造毘盧遮那佛坐像)은 조각수법에서 볼 때 뛰어난 작품은 아니지만 통일된 균형미를 보이는 점이 우수하게 평가되며 도피안사 철조비로자나불좌상(국보 제63호), 보림사 철조비로자나불좌상(국보 제117호) 등과 함께 통일신라 후기인 9세기경에 만들어진 것으로 추정된다. 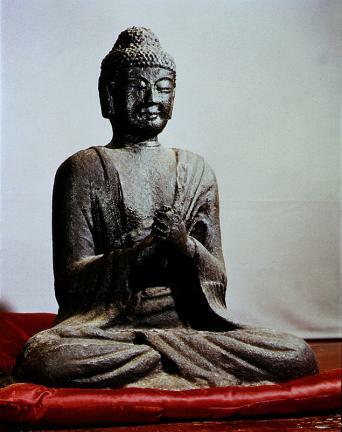 The Vairocana Buddha, which was believed to be the commander of spreading truth thoroughly around the world, was originally located in Donggye-ri, Seobang-myeon, Gwangju, and subsequently moved to Jeungsimsa Temple in 1934. Although the mandorla (Buddhist halo of light) and the pedestal are missing, the statue itself is complete. 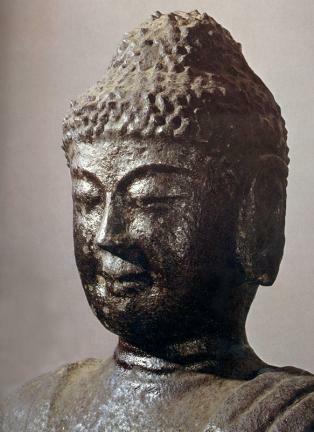 The usnisa (protuberance on top of Buddha's head), which is shaped like a topknot on top of the wavy hair, is placed up high and shown clearly. The oval smiling face harmonized with the eyes, nose, mouth, and other features show a realistic expression of the human figure. The Beobui (sacerdotal robes) covering the shoulders as well as the wide chest is very thick that the curves of the body are hidden, but its well-proportioned sizes down to the knees give a sense of stability. The thick lower ends of the clothes covering two arms run down, making the regular folds parallel. The hand position is uniquely expressed such that the left hand holds the right index finger and is in contrast to the general style of Vairocana Buddha. Although this iron seated statue does not show outstanding carving methods, the balance of the statue is remarkable. Along with the Iron Seated Vairocana Buddha of Dopiansa Temple in Cheorwon (National Treasure No. 63) and the Iron Seated Vairocana Buddha of Borimsa Temple in Jangheung (National Treasure No. 117), this iron seated Vairocana Buddha is assumed to have been built at the end of the Silla Dynasty in the 9th century.